Do you need a lift? This featurette for The Little Prince will take you away. I keep searching for lightness during what feel like dark days. 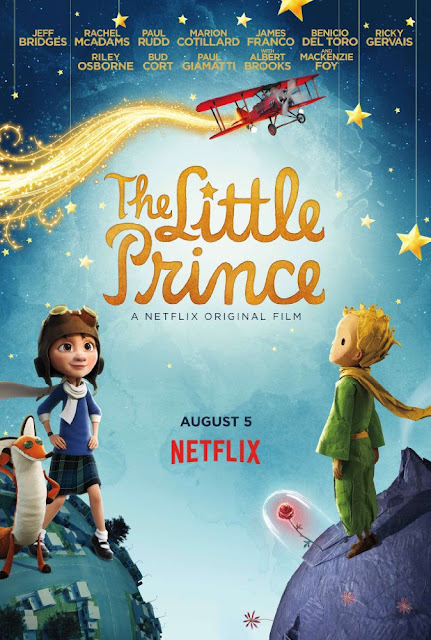 Discovering this featurette for The Little Prince brought a needed touch of lightness into my world today; I’m hoping it will do the same for you. Watch as a the talented artists behind the making of The Little Prince create strikingly beautiful visuals. You’ll no doubt recognize Jeff Bridges as the voice of the aviator, Rachel McAdams as the mother, while the rose is voiced by Marion Cotillard. The little girl reading the book is Mackenzie Foy, Murph in Interstellar. James Franco, Benicio del Toro, Ricky Gervais, Bud Cort, Paul Rudd, Paul Giamatti and Albert Brooks are among the voice talent in the movie. Could be fun to watch it just to play the “Who is that?’’game most of us, consciously or not, play while watching animated flicks. The Little Prince is streaming on Netflix now.